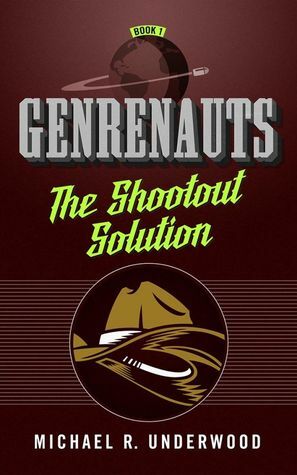 Genrenauts: The Shootout Solution is the first in a new series of novellas by Michael R. Underwood that explores and interrogates genre tropes with a premise that is basically like what would happen if the mid-90s television show Sliders got mashed together with the popular fiction section of a Barnes & Noble. It’s a fun idea, and it more or less works. Leah Tang is a great protagonist who’s funny, smart and resourceful. It’s not often that an Asian-American woman gets to be front and center in a speculative genre, and this makes her a great choice to take the lead in a story that is very overt in its critical examination of genre standards. It’s nice to see Leah’s race and gender considered as positive job qualifications that, along with her background as a stand-up comedian, make her uniquely and especially qualified for the work the Genrenauts are doing. Starting the series off with a look at the Western genre, which isn’t widely read these days by the under-60 crowd, is an especially smart move on the part of the author. I expect that this is the genre that younger readers will be least familiar with, which makes it a perfect introduction to the Genrenauts world and an ideal backdrop for establishing characters and easing the audience in to some of the deeper ideas that Underwood is concerned with. As an exploration of genre as a concept and an in-depth look at some of the more widely used tropes of genre fiction, The Shootout Solution feels a little simplistic, though it hints at more sophisticated genre analysis to come. Hopefully, future books in this series will raise the stakes and broaden their scope, as this one never felt particularly dangerous, and the actual solution, when it’s discovered, was obvious and too-heavily telegraphed to surprise anyone with a higher than 101 level understanding of literary criticism. The author himself has referred to this book as the “pilot episode” of this series, and it definitely reads like one. Much of what we get in The Shootout Solution is worldbuilding, character introductions, and set-up for the rest of the series, so this volume ends up a little light on plot. Like many a promising pilot, The Shootout Solution feels just incomplete enough on its own to make me want to come back for more of the series.